I hypothesize that the direct cause of acne is shear stress on the skin. Shear stress is defined as stress that is applied parallel or tangential to the face of a material. For example, this would be dragging your finger across your cheek while pressing down (i.e. inducing friction). This is not to be confused with normal stress, which would simply be taking your finger and pressing down on your cheek. I believe you can do this all day and never cause a pimple. If the skin encounters shear stress with force and frequency, I hypothesize that a pimple will form in about 24 hours. Shear stress on the skin can come from a wide variety of things, some internal, some external, some organic, some inorganic. Tensile shear stress is when skin is stretched apart. I hypothesize that this produces a fluid pimple. Compressive shear stress is when skin is squeezed together. I hypothesize that this produces a solid pimple. I think mud is a perfect analogy for your skin. 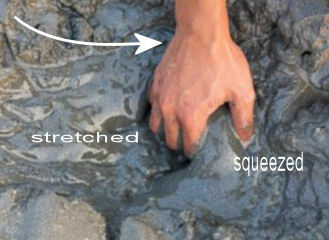 If you use your arms and part mud two ways, you create a void in the middle that slowly fills with water. If you press mud together then it will harden and lose water. This is basically how I believe pimples behave. Now you know why I prefer to call them “fluid pimples” and “solid pimples” rather than whiteheads and blackheads. By looking at the location of a pimple and applying my hypothesis, you can figure out what (shear stress) action caused the pimple to develop. 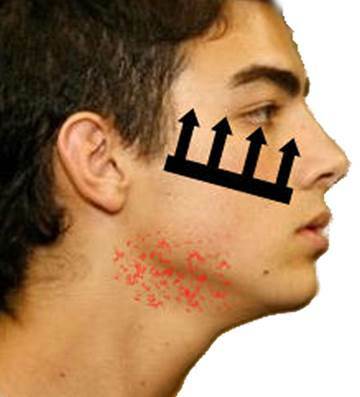 One of the most common locations of fluid pimples is under the jawline. I hypothesize that most of these cases are caused by resting your head on your hand (on a desk). You are unwittingly shoving skin on the cheeks upward. If this is done frequently and vigorously (i.e. quantity and quality) then I expect whiteheads to form. They don’t surface on the cheeks as one might expect, though. They surface on the skin under the jawline due to the convexity of the jawbone. Convex curves from underlying bones can cause skin at certain areas to stretch more than skin at other areas. Another common location of fluid pimples is on the forehead. Skin on the forehead can be stretched by frequently and vigorously pulling hair upward. For example, tying up hair or using a hair straightener can cause forehead pimples. In this example, the actual scalp doesn’t develop acne because the scalp acts as a single, connected unit. Thus, the skin on the forehead is the most stretched area. Most cases of forehead pimples, though, arise simply from vigorously and frequently scratching the forehead with fingernails. By far the most common location of solid pimples, a.k.a. blackheads, is on the nose. This isn’t by chance—it’s due to the collapsible nature of the nose. Pinching or squeezing the nose is creating compressive shear stress on the surface of the nose. Thus, frequently and vigorously pinching the nose leads to solid pimples. This can also be accomplished with some facial expressions such as scowling. Picking your nose has the opposite effect. It stretches the surface of the nose and produces a fluid pimple—predictably on the surface of the nostril that was picked. Fluid pimples that develop on the edge of your eyelid are commonly known as styes. These are caused by stretching the skin of the eyelid. 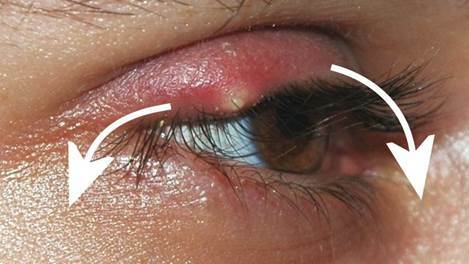 If you frequently and vigorously pull down the flesh on the left and right of your eyeball, a fluid pimple will result on the upper lid margin. Most people inadvertently do this while scratching itchy eyelashes with a finger. Fluid pimples always form on the upper eyelid and never the lower eyelid because we always scratch downward rather than upward. The pimples are fluid, rather than solid, and form on the rim because the eyelid “wraps” around the eyeball, thus making the rim the most stretched area. To see for yourself, put fingers on both sides of one eye and pull downward. If you do this forcefully about twenty times, a fluid pimple will form on the upper eyelid overnight. Fluid pimples commonly form inside the ear canal. Many people call this an ear infection or swimmer’s ear. It is the result of frequently and vigorously picking your ear, because you are inadvertently stretching the skin of the canal. If you think about it, sticking your finger in any tube can only stretch the tube—never squeeze it. Thus, whiteheads and only whiteheads form in the ear canal. Its association with swimming can be explained by the fact that swimming clogs the ears with water, which people cope with by picking their ears. Shear stress does not have to come from the hands. It can also come from within. Studies have found a correlation between back acne and the wintertime. I hypothesize that, during the winter, people often curl up and sleep on their side to conserve body heat and stay warm. When a person sleeps on their side, the spine juts outward and the shoulders turn inward. The resultant convex shape of the back stretches the skin on the back and therefore eventually produces fluid pimples. In addition to this, solid pimples may form on the chest because sleeping on your side creates a concave chest. The fact that acne occurs on the back and chest favors my hypothesis over the popular hypothesis that acne is caused by dirt, oil, or bacteria (from the hands). Underlying muscle development that is big and sudden is capable of stretching the skin to the point of causing fluid pimples. For example, sourdough bread has a tough, chewy crust. If you were to eat an entire loaf in one sitting, your masseter muscles would get a workout and swell up. Overnight, a fluid pimple or two would develop directly atop the masseter muscles (i.e. the side of your jaw). A common side effect of taking anabolic steroids is acne. I believe this has nothing to do with the chemical composition of the steroid and everything to do with sudden muscle growth stretching the skin. Naturally working out a muscle with high-intensity can also give rise to a pimple atop that muscle. However, if you already have well-developed masseter muscles then the skin wouldn’t stretch as much and thus no pimple would form. See, when it comes to underlying muscles stretching or squeezing the skin, usage history matters. Sudden muscle growth is also how I explain hormonal acne. I believe a surge in testosterone or a drop-off in estrogen hormones can cause one to suddenly use muscles that were previously unused. This leads to growth beneath the skin which leads to stretched skin which leads to a fluid pimple. I hypothesize that most recurring acne is due to the vicious circle of pimple extraction: when you squeeze out a pimple, you’re also stretching the skin that surrounds this pimple. Since two fingers are usually used, this is usually two distinct locations. Thus, one or two pimples will surface soon after, and they will always be whiteheads. This vicious circle is why it seems as if pimples are caused by germs and spread to nearby skin. The best way to extract pimples without stretching the surrounding skin is to use a simple invention. Sorry, it’s not out on the market yet. Acne can be prevented by not applying any shear stress on the skin. “Just don’t touch your face” remains true, but not because of germs. Shear stress works via friction, so if you absolutely must rub your face or body a lot then I highly recommend using oil. A massage is basically applying shear stress to the body (to knead the muscles beneath the skin). Thus, getting a massage without using massage oil will induce pimples. Although I said there’s basically two types of pimples, the fluid and the solid, a third type exists between these two and has the consistency of cream. It’s the result of a compressive shear stress and tensile shear stress. This kind of pimple is rare, though, so I left it out for simplicity’s sake. Different people have different skin compositions. This means that some people will be more prone to acne than others. For some, it may only take ten pulls on the sides of the eye to induce a fluid pimple on the upper eyelid margin. For others, it may require a hundred vigorous pulls. Diet and/or genetics may be partially responsible for different skin compositions. In my opinion, exposing skin to sunlight is extremely beneficial as it seems to renew the skin. If you can’t get sunlight, vitamin A is quite effective. The topical form is commonly known as retinol. The oral form is commonly known as Accutane.